Today we had district-wide Professional Development. On Wednesday of last week the “Activity Catalog” in our web-based ‘PD Planner’ updated to show the options for the full-day sessions. Immediately emails began popping up on the PTRN listserv. 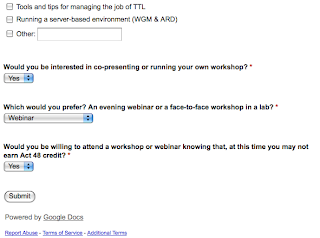 There was NOTHING being offered for TTLs (Technology Teacher Leaders) or lab teachers. As such, we were all forced to pick a session that may have had little or nothing to do with what we do on an everyday basis. As a joke, I sent out an email saying “Hey, I’ll hold a workshop!” Surprisingly, many people responded to me asking if I was doing a workshop, and that if I was that they would sign up. This spawned the idea of proposing such a crazy idea to someone higher up, which I did. A few hours and emails later, at the end of my PD session, through a beautiful act of serendipity, I was sitting in the same room as the head of Educational Technology who had received my proposal and was enthusiastic about the idea. 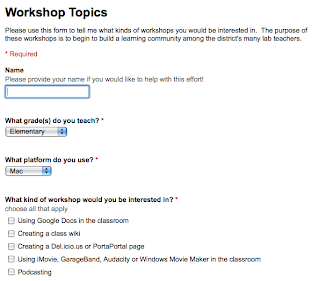 I created a discussion on our Ning (Philly Teacher Techs) and included a link to the Google form. I then sent out a message to all of the members asking them to fill out the survey to help me know what kinds of PD people want. I also added questions asking whether people would be willing to help present or present their own workshop, whether people would prefer a webinar or a face to face workshop and whether people would be willing attend knowing that they may not get Act 48 hours for it. Within 5 minutes of sending out the link I had no less than 7 replies in my spreadsheet! This is proof enough that there is a high level of interest in professional development geared around what teachers want and that it is not being offered. I know this is based on the topics I chose. I have seen one or two of them listed perhaps once or twice during the school year as an after school workshop with a limited number of openings that usually close up, but most have never been offered. However, the topics that I’d never seen offered were the topics that most people chose! 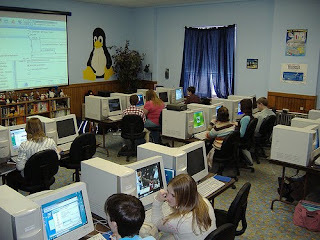 What makes the job of a lab teacher so hard is that we often work in isolation. While grade teachers have their ‘grade groups’ or ‘grade partners’ with whom to bounce ideas off of, we do not. There is (usually) only one of us in the building. We also often wear many hats which are not technically in our job description. As a result, the job can get pretty darn overwhelming. My goal for starting these workshops is to build a learning community for us so that we have someone to reach out to in times of need and so we have others to share our own ideas with for feedback. The most amazing thing? Out of 8 total responses so far, 100% said they’d be interested in helping present and that they would participate knowing that they wouldn’t be compensated. Already it is obvious that these workshops will be effective because teachers WANT the information and are willing to SHARE information and it is RELEVANT to what they do in their classrooms. I see a small ray of light shining at the end of the tunnel and the best part is: I don’t have to make the journey alone! Thanks! You can be sure I'll be keeping you updated. I hope it works out! The reason why the conversation I had was so refreshing was it was the first time I had not been 'shut down' or wishy-washy-ed EVER by someone higher up on the ladder. Admin support is SO important and it's something you have no control over! Are you familiar with eSchool News? they're giving out free subscriptions. If you're interested the sign up link is here When I was a trainer I found it to be one of my favorite sources for educ tech news.